The literature of war has long included works that resonate with teenagers, from Stephen Crane’s The Red Badge of Courage to Anne Frank’s The Diary of a Young Girl. Adding to such a beloved canon would be a tough feat, but setting lofty considerations aside, Sharon E. McKay’s latest novel is an entry that offers healthy optimism about friendship’s capacity for sacrifice. 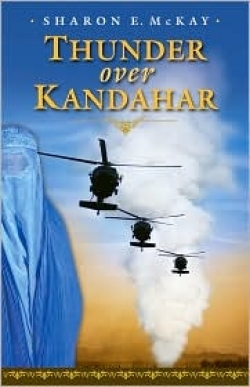 McKay, the first novelist for young adults to be designated as a Canadian War Artist, has drawn from her travel in Afghanistan to create Thunder Over Kandahar—a bracing, if at times providential, account of crossing borders, surviving bombing, and embracing adoption, among other topics. At first, Yasmine and Tamanna could not seem more different. One girl was raised in England as the only child of Radcliffe- and Oxford-educated parents, thus accustomed to certain privileges and freedoms; the other, whose brother was coerced into joining the Taliban, is bound by filial expectations, including the prospect of early marriage. When violence forces the two girls to escape their homes on foot, they reveal a courage born of a friendship that is more akin to sisterhood. Throughout their journey, potential dangers arise in the form of land mines and the threat of discovery. McKay avoids dwelling on the fact that young travelers could experience sexual violence, but she does acknowledge the reality of living in tumultuous times. She effectively portrays the unsettled—and unsettling—terrain in which a mere word or gesture could invite trouble, and where despair once led a character to contemplate suicide by immolation.